When my husband and I first started our real journey to get out of debt in January of 2013, it wasn’t by any means the first time we’d attempted to get out of debt. Several times before in the course of our 17-year marriage we’d started getting out of debt, and even gotten out of debt on occasion, but we always ended up right back in the hole. Why? Because we didn’t have the right attitude about debt. You see, in our minds, debt was okay as long as we could manage the payments, and while that is an important factor on some level, for us, we chose to view it as an excuse to spend money we didn’t have on things we didn’t need. We had no emergency fund to speak of and a ridiculously high debt-to-income ratio, all because we had a carefree attitude about our debt. We didn’t view it as a potential problem. In October of 2012, we made a move to another home, one in which we added more debt (but the payments were the same as our other house, so it was “okay”), and then added more consumer debt as we purchased things we needed for the new house. It was at that point that we recognized that we were walking, from a financial standpoint, dangerously close to disaster. One missed paycheck, and our house of cards would’ve come tumbling down quickly. Something clicked, and we finally saw the dangers of our carefree attitude about debt. We recognized that debt limited our choices: our choices about where we could work, live and what we could do in our free time. We saw that we were, in fact, slaves to our debt, as John mentioned in the intro post for this series, and it terrified us. And because we have four children, we also recognized that our attitude about debt had put them in a very precarious situation. If the house of cards fell down, it wasn’t just my husband and I that would be affected, but our children too. So how did we change our attitudes about debt? First, we came to recognize that a large amount of consumer debt really does make you a slave: to your lenders, your job, etc. We didn’t want other people to be in control of how we spent our time and money, so we made the decision that we would work out a plan to eliminate our debt. Second, we started to view our consumer debt as an enemy – an enemy that kept us from pursuing what we really wanted to in life. This changed how we spent money. We started to value our hard-earned money, and our time, more, and we didn’t want to give it all to our enemy: debt. This in turn led to better spending decisions. Third, we started to view ourselves as financially secure people. This was vitally important, because when you’ve been broke all of your life, you tend to get comfortable and used to not having money. When you get used to a lifestyle of being broke, it becomes very easy to shirk responsibility and convince yourself that it’s not your fault, you just don’t make enough, blah, blah, blah. However, when you view yourself as a financial secure person who is wise with his/her money and time, it helps you to make spending decisions that allow you to move toward your financial goals. If you truly want your debt reduction or financially secure/independent plan to succeed, it has to start with the right attitude. If a better and more secure financial life is on your list of goals, take some time today to assess what your attitude about debt and money has been in the past, and choose to have a new attitude: one that is committed to reach your goals of being free of debt. Do you have a carefree attitude about your debt? Do you have debt and feel that, on some level, it enslaves you? If you’re debt free now, what did it take for your attitude to get in the “right” place to attack it? This post was featured on The Value Geek and Budget for Health. Right on! I agree that this attitude is very important. When my twenty-something daughter justified a big expenditure by saying “Oh, well, I’ll always be in debt” I cringed and wondered how did I contribute to this attitude? Thankfully, I sat down with her sometime after that and reviewed her budget and helped her to develop a plan to eliminate her debt. She never tried to do this, because she had the overarching attitude that it was impossible. Once I showed her what it would take and how long it would take, I unleashed a Tiger and she became debt free and announced this to me this past Mother’s Day. I was so proud but mostly happy for her to learn this new skill and more importantly the right ‘tude! Debt, that is an AWESOME story!!!! What a terrific Mother’s Day gift, and what a great gift you gave your daughter, showing her that debt freedom IS achievable. Congrats! I really do think that attitude is everything when it comes to debt. I pay more on my student loans in an effort to get out of debt. As soon as I’m debt free (that is my only debt), you’ll hear me screaming in excitement! Even though I can afford my payments and pay more than is required of me, I still feel enslaved to the debt, really. Paying it off faster takes commitment and sacrifice. But in the end it will be worth it!! Natalie, exactly!!!! You’ve made so many good points here. SO excited for you that you’ve got the right attitude about trashing your debt ASAP. Changing my attitude is what saved me from going more into debt. Like Debt debs’ daughter, I used to always think “I’ll always be in debt.” And it really felt that way until I decided that couldn’t be true. I soon found out that I was just being a fool and I couldn’t believe how I let myself think like that. I definitely had a carefree attitude about spending and debt. We didn’t have massive amounts of debt, but we definitely didn’t have the savings we could have/should have had if we weren’t spending so much. Me and FB Hubby definitely had to have an attitude adjustment and now we literally think of every expense as the enemy too. And every dollar spent is a dollar that takes us further from our goals which just makes our journey longer and who wants to be on the road that long? Same with us, Shannon, and it’s so wonderful odd to have that “enemy” mindset. A treat for us now is NOT spending money, because we know we deserve financial freedom more than we deserve stuff. I think we’ve certainly been down the same road. I felt like I was writing this myself. If you believe everyone else, you are supposed to be in debt so why on earth would you ever think you could pay it off? I’m not sure who started this trend. Maybe credit card companies? Anyway, we need to think like our parents. If you don’t have money for it right now, you can’t afford it. Attitude is everything especially when paying off debt. It can be the difference between paying off all your debt and not having enough. Its important to keep that in mind when you are in that situation. So true!!! I always say that most of the battle of getting out of debt is the battle in your mind. I agree that your attitude can make a huge difference! You have to focus and you have to “want it.” Otherwise it’s too easy to get off track. “you have to want it”. So true, Holly. That is crucial to success! I really like this post, and I agree to all of it! 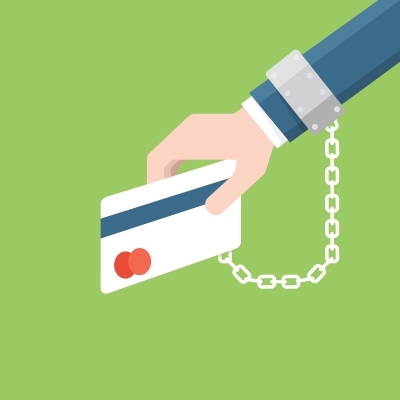 Being completely free from debts definitely requires you to change your attitude, otherwise those debts keep coming because they’ve become your lifestyle, and that’s dangerous if you want to be financially independent! Thanks for sharing! So true!! We have finally started to make a dent in our debt because we now have an attitude of being debt free. I myself have carefree attitude anything about money. We had financial disaster before which we learned a valuable lesson. That’s why we are really thinking every expense we do and every dollar we spend so that it can help us for the financial goal we want to achieve. That’s great, Jayson! Good to know that you’re using wisdom and evaluating those expenses! People need to take a hard look at why they are in their current situation. Only careful consideration and a plan will lead you out of your problem. People want a magic bullet, a pill or some insurance that they will get out of debt quickly and never get there again. Only perseverance and discipline will that, folks. Simple as that.